There are many reasons why your fish may not be eating or eating less. Thankfully most of the reasons can be corrected before there’s any longterm consequences or even deaths in your aquarium. Why are your fish not eating? There are all kinds of reasons as to why your fish aren’t eating. It could be one thing, or it can be the culmination of several. The number one reason is always disease or illness. This is usually caused by poor water conditions. If your fish aren’t eating, the question that you should ask yourself is, is my husbandry bad? Husbandry has to do with the type of environment you have set up for your fish. 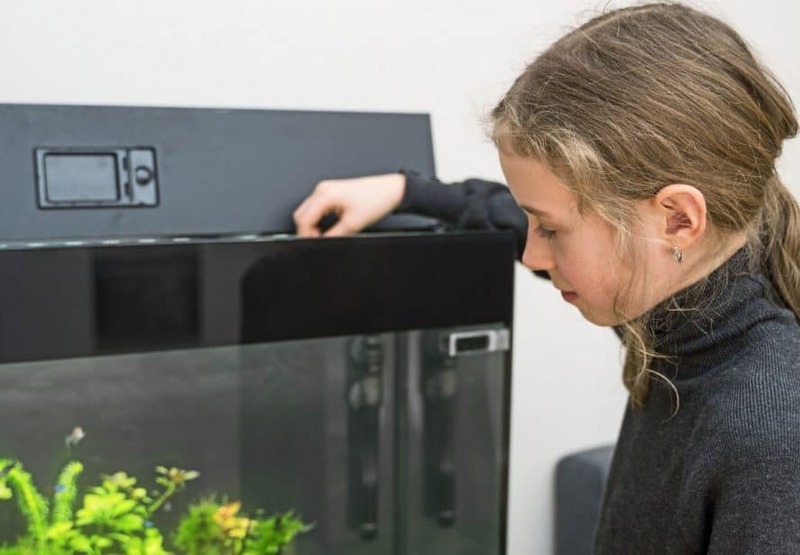 When keeping fish, it is important to do your best to replicate their natural habitat by supplying the correct lighting needs, and appropriate water temperature. The closer to replicating every aspect of your fish’s natural environment, the more likely they will thrive. This means appropriate lighting, specific foods, and sufficient space to grow and move around. These are all the different aspects of fish keeping that makeup husbandry. Bad water quality is arguably the most common reason fish stop eating. Fish are sensitive to changes in pH balance, and chemicals in the water. Remember, fish eat, swim, pee, and poop all in the same water; so if the water isn’t changed on a regular basis, things can get nasty really fast. If the water quality gets bad enough, your fish will stop eating because ammonia is one of the chemicals found in fish urine, and when its levels become too high, it will make your fish feel awful. 10 to 15 percent water changes weekly are recommended. To test the water quality in your aquarium you will need to buy and use a freshwater fish tank test kit. We use the API Master Water Test Kits which are available for both Freshwater & Saltwater Aquariums. A very common mistake, especially with beginner fish keepers, is feeding the wrong type of food. There are a lot of options available, so getting confused about what food your fish may need is understandable. What type of food should you feed? The best thing you can do is be sure to read the label. Most fish food manufacturers list what species of fish their specific food is made for. Find the one that states it is for your fish. For many reef fish, a variety of frozen meaty foods such as brine shrimp or krill, are available. Always be sure to feed for correct species. Food made for freshwater fish may not contain all the sufficient nutrients that a reef fish may need. The key is to use a good quality staple food daily with some live foods, frozen or freeze-dried foods a few times a week to add variety to their diet. We use Tetracolor daily for our Freshwater fish and Omega One Marine Flakes for our saltwater fish. Use either of these flake foods daily and you’ll be giving your fish the best daily intake of vitamins and nutrients they need to thrive. Just remember, these foods alone will not have all the goodness they need! Keeping the water in your tank as close to the temperature your fish would experience in nature is ideal. Most species freshwater or reef fish, seem to do best in a tank that stays between 74 and 80 degrees Fahrenheit (23 to 26.5 degrees Celsius). Is your water too cold? When the temperature in your fish’s aquarium starts to drop below about 74 degrees Fahrenheit (about 23 degrees Celsius), their metabolism also begins to drop. Well, slow down really. Fish do not regulate their internal body temperature as humans do, so they rely on the ambient water temperature to keep them comfortable. Incorrect water temperature can cuase their metabolism to slow down. When a fish’s body temperature drops below its optimal operating level, they begin to feel sleepy and sluggish. They won’t swim around as much, therefore won’t really feel the need to eat. If this problem isn’t remedied rather quickly, it could lead to starvation. 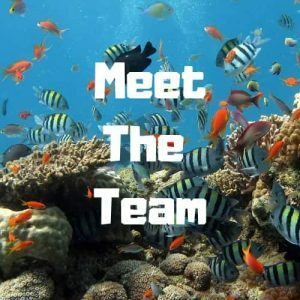 Remember, you never want to change anything quickly in an aquarium, because unlike the ocean, or a lake where there is an abundance of water, your aquarium is a closed system with a much lower amount of water and will respond much more quickly to change, your fish may not tolerate this very well. 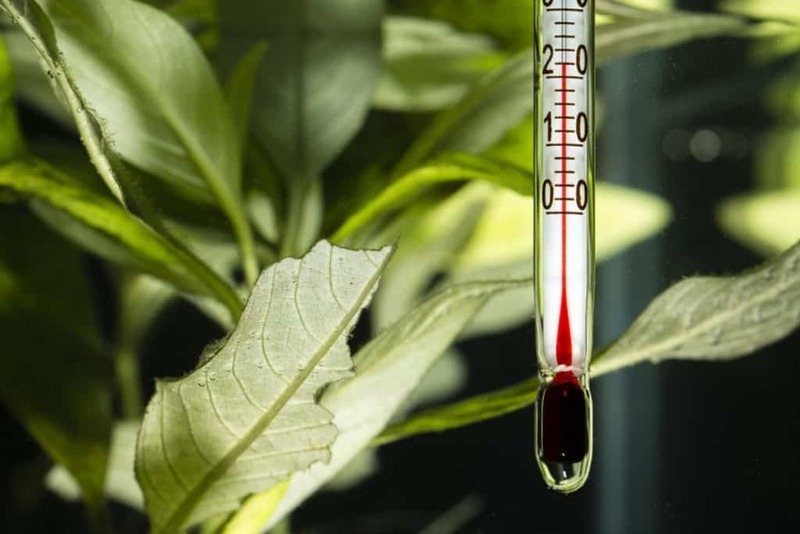 We have a complete Guide to aquarium thermometers that may help you control and maintain the correct temperature in your aquarium. What if the water temperature is too hot? Having the temperature in your fish’s aquarium too hot can be just as bad, if not worse than having it too cold. When the water temperature rises above a comfortable temperature for your fish, they may become hyperactive. It may seem better than sluggish or sleepy, like when the water is too cold, but it, in fact, is very dangerous. When your fish become hyperactive, they are also causing themselves to stress, because the hotter the water gets, the more difficult it becomes for your fish to absorb oxygen. This feeling is very stressful and can definitely cause your aquatic companion to stop eating. Look out for signs of low oxygen in your aquarium. 4. Can My Fish Be Stressed? The answer is most definitely. Most aquarium fish come from places where they may need to keep watch and have a place to hide from larger prey. If they are not provided with an adequate place to hide and feel safe, then your fish may begin to stress. Imagine yourself laying out in the middle of the street trying to go to sleep. Your fish feels the same way, and just as with humans, fish also need a certain amount of sleep to stay healthy. Providing aquatic caves or dense vegetation is the best way to make your fish feel safe. The longer your fish stay stressed, the more prone to diseases they may become. 5. Can Disease Stop Fish Eating? It is important to realize that disease is simply the unnatural state that the body is in. So, diseases may not necessarily mean illness, it just means something physically, chemically, or even mentally, is wrong. Some diseases, take ich (Ichthyophthirius multifiliis) for example, affect the exterior parts of the body, but can make your fish feel awful. Ich is almost always fatal if left untreated. Another dangerous aspect of ich is its ability to spread. It is incredibly contagious, so it is absolutely imperative that you do not flush your fish down the toilet or drain, as you may introduce a deadly disease into a very delicate ecosystem. Read all about Tropical fish disease in our complete guide. Unfortunately, even though your fish live underwater, they are still susceptible to their own kind of parasites. Monogeneans, parasitic copepods, and even leeches can be carried by fish, and any one of these can make your fish feel bad. Parasites are anything that lives on or inside a host and takes nourishment from it. When most people think of a parasite, they automatically think of a mite of some sort. Actually, little single-celled organisms called, protozoa, can only be seen through the lens of a microscope but can make your fish feel really sick. Sometimes when fish have contracted some kind of parasite, they will become more susceptible to infections. Parasites feed off the nourishment of their host, so by doing that, they also make the host immune system weaker, therefore allowing infections to take hold. Your fish swim in and out of little crevices all the time, and sometimes they may get a little scrape or cut from a sharp rock. Usually, this little scrape goes unnoticed, but if a parasite has weakened their immune system, that little scratch can become a serious infection. Fungal infections are very common in both freshwater and reef aquariums. Cotton fin (Cotton wool disease), affects the fins and mouth of infected fish. Cotton fin is so named because it grows into a fluffy white mass, on the fins and/or around its mouth. It is usually found where an infection, parasite, or injury was present. It is a fast-growing, and extremely contagious fungus that can kill off an entire aquarium if left untreated. Bacterial infections are always a worry for fish keepers. Aeromonas is a particularly bad little bacterium, that seems to be more prevalent in freshwater fish. Aeromonas, like most other bacteria, thrive in aquariums where the water quality is very low, and the fish have poor nutrition. These conditions make it very easy for the bacteria to thrive in its host and can eventually lead to death. Signs of infection include but are not limited to, bulging eyes (exophthalmos), ascites (accumulation of fluid in the abdomen, or ragged unhealthy fins. Weekly water changes, combined with the use of quality RODI (reverse osmosis deionized) water, can significantly lessen the outbreak of most fungal and bacterial infections. Just keeping the water clean can really make a difference in your fish’s appetite. You might think that since you leave the light in the bedroom on, your fish are getting enough light, right? Wrong. This is especially true with reef aquariums. Have you noticed how the colors in reef fish are usually much brighter and bolder than the color’s found on freshwater fish? Some of these colors are not actually pigmented at all, but actually a living bacterium. These bacteria live inside their host but offer beneficial nutrients to it as well. In this way, the bacteria are not considered a parasite, because they supply a benefit to one another. This relationship is called, Symbiosis. These bacteria though, rely on a specific light spectrum to thrive and be healthy. Using a bulb that does not emit this unique spectrum, can lead to the under development of these bacteria, and cause your aquatic friends to feel bad. Remember, they need each other to be healthy, so whatever happens to one, will affect the other. So, it is very important to read labels and even research the fish you are going to keep, in order to ensure your fish are getting appropriate lighting. Most bulb manufacturers will have a list of light spectrums their bulb is capable of emitting. You need to provide the correct food for each type of fish. It may not seem that fish would be picky about what they eat, but they can be stubborn and not eat – to the point of starvation if they have to. 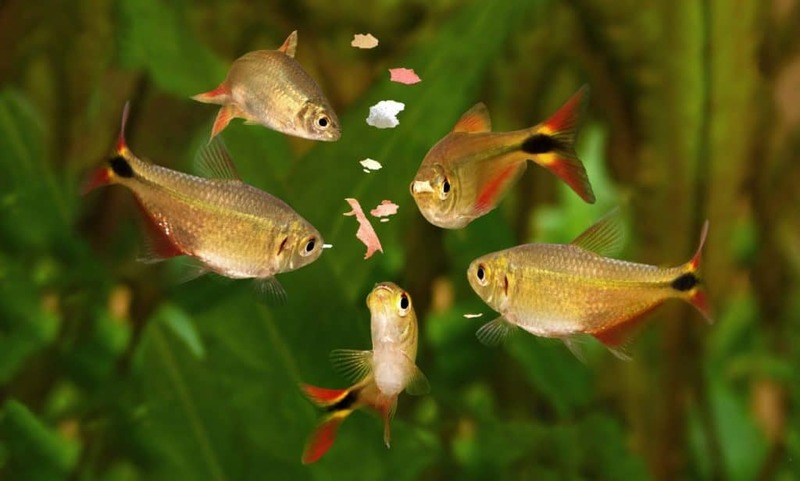 It has been observed by fish keepers who just wanted to give their fish something different to eat. Mix it up a little. Their fish will take the food in, only to immediately spit it out again. The fish will literally spit the food out and won’t take another bite. You should also avoid overfeeding. Sometimes your fish may not eat, because they’re already full. When you overfeed, you also leave more uneaten food in the tank to decompose, causing poor water conditions, ultimately leading to your fish feeling sick. Dirty water means unhealthy fish. So, if you’re noticing more detritus (uneaten food) in the tank, then it would be recommended to find food that is more appealing. Find something they’re excited to eat. When you find something, your fish like to eat, you will know immediately. When fish like what they are eating they usually seem kind of hyperactive, swimming around while they eat, just as they would in the wild. Many reef fish are captured in natural reefs and still maintain their wild instincts. Also, read the label. Make sure that particular food is suitable for their species. Some species require specific nutrients that just a general flake or pellet food may not provide. Some aquatic species like large Catfish, lionfish, and Triggerfish, require whole meaty diets. Chopped squid, whole shrimp, and whole krill are normal foods in these fishes’ diets. A pellet food would not supply the proper amount of protein needed to thrive, and also these species use the shell of these crustaceans to keep their teeth filed down. If their teeth don’t stay ground down, they can overgrow, making it impossible for the fish to eat. Conclusion: Why Are Your Fish Not Eating? So, if you have ascertained anything, it is that there are all kinds of reasons why your fish are not eating. Most of which can all be summed up into one word, husbandry. Husbandry affects every aspect of your fish’s life. Water quality, lighting, food, water temperature, all these things make up husbandry, and the imbalance of any one of them can result in your fish not wanting to eat. When keeping fish, it is important to maintain a balance between all these things, and the more natural it feels to your fish, the more likely they will grow and be healthy. Therefore, by feeding the appropriate food, and maintaining a healthy environment, you are giving your fish the opportunity to stay healthy. Also, let’s face it; no one wants to look at a dirty tank.